President Obama put income inequality back in the news with a speech Wednesday saying the nation must address the growing gap between rich and poor. In most advanced countries, there is a correlation between public concern about the rich-poor gap and the underlying economic reality. But in the U.S., compared to the other wealthy nations surveyed, the disconnect between public concern and the size of the gap is large. Concern about inequality around the world is strong in developing economies, where a median of 74% cite the gap between the rich and poor as a very big problem according to a Pew Research Center survey conducted this spring. This includes 86% of Lebanese, 85% of Pakistanis and 82% of Tunisians. Meanwhile, the developed world shows a wider range of views: 84% of Greeks say inequality is a very big problem, but only 47% of Americans and 45% of Canadians agree. Income data provides insight into these views. There is a strong correlation between actual income inequality and the public’s views about the issue in most advanced economies, except in the U.S.
Americans in the upper fifth of the income stream make 16.7 times the income of those in the lower fifth. Yet barely half (47%) of Americans think that the rich-poor gap is a very big problem for the U.S. While the connection between the size of the income gap and the extent to which the public considers it a big problem is not strong in the U.S., other nations’ views are more aligned with reality. Australia is a country where income inequality is relatively low and the public is among the least worried about the gap between the rich and the poor. Australians whose income is in the top fifth of the income stream make just 2.7 times more than those in the bottom fifth. Just a third (33%) of Australians say inequality is a very big problem. Conversely, the top fifth of the Chilean population makes 13.5 times what is earned by the bottom fifth and 79% of Chileans believe inequality is a very big problem. Similarly, the top fifth of the South African population makes 25.3 times what the bottom fifth earns and 70% of South Africans complain that inequality is a major economic concern. In Europe, yet another picture emerges. Income inequality is lower than that in the U.S., but higher percentages of the public in Europe believe it’s a problem. Meantime, Germany stands out among European countries for a different reason: It is a nation where inequality as measured by wealth is much greater than inequality as measured by income. The wealth ratio – the portion of wealth controlled by the top fifth of the population compared with the portion controlled by the bottom fifth – is 12.9-to-1, the highest in Europe. However, only half (51%) of Germans think inequality is a very big problem, among the lowest levels of concern in Europe. 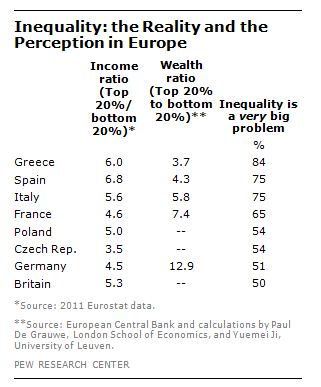 Conversely, the wealth ratio in Greece is only 3.7-to-1, and yet 84% of the Greeks say inequality is a very big problem. Note: A previous version of this post incorrectly stated that there is a correlation in all countries between income inequality concerns and reality. The correlation is evident for advanced economies, with the exception of the U.S.